The Aboriginal Heritage Office is pleased to welcome Corey Grech for our next Yarn Up. 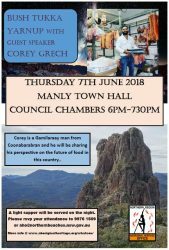 Corey is a Gamilaraay man from Coonabarabran and he will be sharing his perspective on the future of food in this country. Come and join us. A light supper will be served. Council Chambers 6.00pm to 7.30pm.